Available now on Netflix (go watch it!). 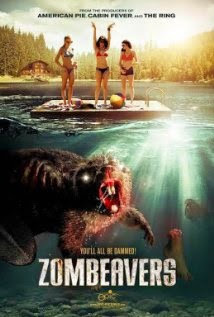 When I first heard about Zombeavers I giggled/snorted cause I'm all about that life. I immediately went looking for an interview with someone from the movie and managed to score one with writers/composers Al and Jon Kaplan (interview here). And yes, they are as awesome as you would think. This movie gives you everything you think it will and more. It is one big horror movie cliche, but what makes it work is they know it and make no excuses, turning into a campy piece of work. There were actually some twists I didn't see coming. But that very last scene of the movie is priceless because you know exactly where it is going. When I first started watching I wasn't all on board. I started nitpicking at the acting and dialogue. And who in their right mind would go swimming in that nasty a** looking water. But give it time! Once you acclimate to things and see that first Zombeaver you will be hooked! I was really impressed with the gore effects. While the Zombeavers don't look "real" by any stretch, they are fabulously gross little creatures (actually they're pretty big) and their snuffle/growling is perfect. The theme song for the movie, that plays during the ending credits, is amazingly funny. Don't listen to it on Youtube because it will ruin a lot of the "gottcha" moments. Also make sure you watch to the very end of the movie credits. Should you watch it? Hell yeah! If the trailer gets you all excited then you are gonna love it.